FOG COMPUTING....IS IT BETTER THAN CLOUD..?? So, everyone now-a-days are so familiar with cloud computing but now the question is what is this fog computing is it related to cloud or its different .In this post i'll try to make it clear on the concept fog computing to the extent possible for me . But first what exactly is cloud computing? Cloud provides us certain service like Saas, Paas, Iaas to its users for better performance and connectivity to the cloud. But there are some issues with cloud computing like network latency , needs higher bandwidth for data transfer and it is not that secured so it brings up a question mark on confidentiality and privacy of the user so this where fog computing comes in to the picture . 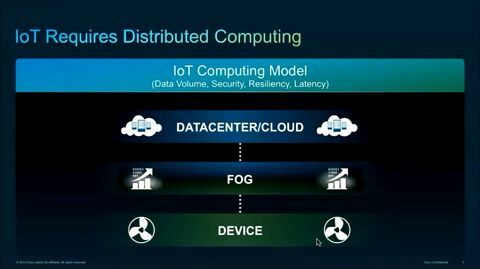 Fog computing is an evolution from cloud which works on edge devices and makes IOT(Internet Of Things ) possible . To be precise it is an architecture that uses one or more collaborative multitude of end-user clients or near-user edge devices to carry out a substantial amount of storage (rather than stored primarily in cloud data centers), communication (rather than routed over the internet backbone), control, configuration, measurement and management (rather than controlled primarily by network gateways such as those in the LTE core network). Fog computing can access Bigdata and is responsible for IOT . IOT is a world where things are connected and can be controlled through smart devices with bigdata and fog computing it can be possible. We are in 2017 and there are about 34Billion devices present and by 2020 it goes upto 50Billon .IOT is the reason where "smart cities " are possible and it can make our lives whole lot of better and comfortable. Fog Computing has 6 dimensions as shown in the figure with these features it is more helpful than cloud and faster with low response time . Where exactly Fog is present ? It is an entry point to any platform and is accessed when the devices are connected to the near edge servers before directly connected to data centres like in cloud so by this we do not require device capability for accessing data it is depended on the capability of edge servers so the responce time is minimum and data can be accessed more fastly and through secured networks with low latency problems in lesser bandwidth . • Realtime response is faster than cloud. • Location awareness to the devices of users. • Low jitters in networks during data transfers. • Less demand of bandwidth. • Secured as data is transfers through edge servers. In my opinion it can because it has all the possibilities of cloud and it can do more than cloud in less time and bandwidth .So ,what do you think do comment ..